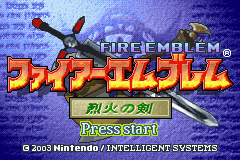 This page contains information about the two known prototype/beta versions of the game, which were made publicly available by Eirika and Tanks. The game was officially released in April 2003 (in Japan), and these prototype versions were created around 2 months beforehand. As such, they are unfinished and also contain a number of changes from the retail version. Note: These patches are not for playing purposes. Also the prototype versions are in Japanese. A fun little extra is that most of the CGs don’t have the grainy sepia layer (like in the retail version) and are, instead, in full colour. Some of the CGs (mostly the later ones) are just black and white sketches though. 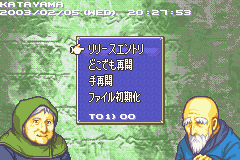 Playthrough Number – Press left and right to select the current playthrough number. Maximum value is 13. Good Night – Activates Sleep Mode. Hold L and R to exit. To access this menu, hold Select and press Start twice on an empty space. This menu is only available in the 0206 build. To access it, hold L and R and then press B. To change settings, press A, B, L or R. If all the selected options are possible, press Start to view the battle. To access this menu, hold Select and press Start twice on a character. Hold B, R and Right to toggle a black and white debug display. Hold Select and press R on a character to display a debug version of the status screen. 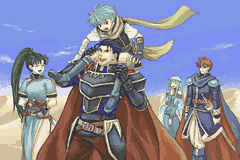 Some of Eliwood, Lyn and Hector’s alternate face sprites are slightly different (eg. Eliwood sad). Raven has grey hair and Heath has red hair. Some bosses have different portraits and/or are of a different class (eg. Aion has Kenneth’s portrait). 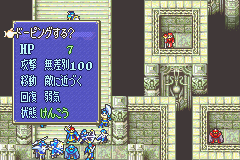 Many bosses have Sword of Seals characters for their mini portrait. Some characters don’t have a mini portrait at all. 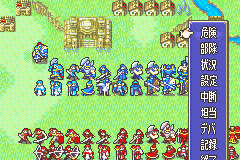 Many characters use the default blue palette for their battle sprites. 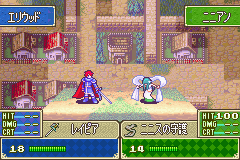 The Knight Lord’s Durandal battle animation is slightly different, especially the critical attack (link to movie). 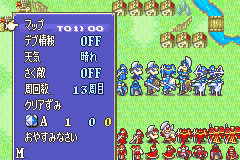 The Blade Lord has an unique battle animation with Durandal (see above movie). In the class roll, the HP bars can go beyond 30. There are extra shops and houses in certain maps. 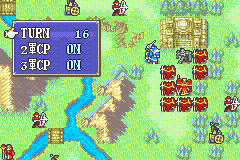 Many enemy units are in different (and, often, completely wrong) places. The Test map has a very different enemy roster if the opening event is skipped (generic enemies instead of bosses). Many items have different stats. Vaida’s Spear, Earth Seal, Emblem Seal and Wind Sword are missing. Replacements for them include the Battle Robe and Battle Call items. The Dancer rings (eg. Ninis’s Grace) have ribbon icons. Also they can only be used from the Items menu. 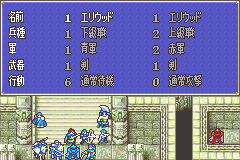 Magical damage uses the user’s Magic x 0.5 (instead of Magic x 1) in the battle formulae. CGs don’t have a grainy sepia layer. Ranking and Tactician stars have completely different graphics. There was a maximum of ~250 support points that could be obtained per chapter (similar to in Sword of Seals). Completing chapters earned a varying number of hidden points (which corresponded to the stars in the Fortune-Tactician window). 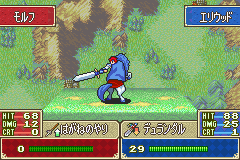 The blade in the Knight Lord’s Durandal animation is much shorter in 0206. Class roll, Battle History, Link Arena and Sword of Seals Link Up are unavailable in 0206. The Final Chapter has a different tileset and (at least in Part 1) fog of war enabled in 0206. The Sound Room in 0206 is similar to the one in Sword of Seals. Many missing symbols in 0206, which are labeled with a love heart. 0206 has additional options in the Configuration menu. Less music tracks in 0206 (around 44). In the Test map (opening event skipped), Fargus is a General in 0206, but a Berserker in 0219.